The weather here in Memphis has been all over the place recently, ranging from storms one day to the mid-70s- to 80s a few days later, which makes planning an outside event risky. Fortunately for Dishcrawl Memphis, the weather for last night’s event Seis de Mayo at Chiwawa in Midtown was absolutely perfect. 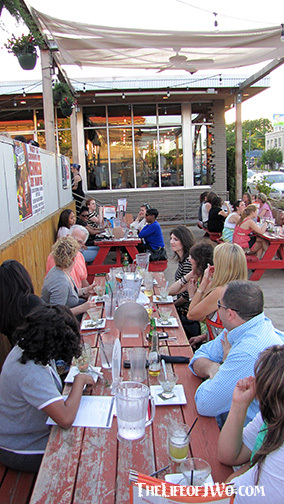 In what was the first of their “Pop-Up Patio Party” series they have planned for the next few months a group of 25 dish crawlers met on the patio at Chiwawa ready to sample some of Chef Ryan McCarty’s best offerings. Tammy and I had been to Chiwawa a couple of times already, including a stop on the Overton Square Dishcrawl, so I knew I was in store for some of Chef McCarty’s fresh spins on Mexican food. This Dishcrawl event was unlike the others we’ve attended in that instead of hitting three or four different locations, everyone stays at one spot and is treated to a five-course meal. Since I was there on my own and as the official event photographer, I found a seat at the end of table, got out my camera and was recognized by someone I met during the Overton Square event. We caught up a little, meet the couple across from us and I got out my camera to start snapping pictures. It wasn’t long before Chef McCarty introduced himself and told us about the first course. A few minutes after that everyone was presented with a glass of shrimp ceviche that contained avocado, onions, jalapenos, tomato and cilantro. 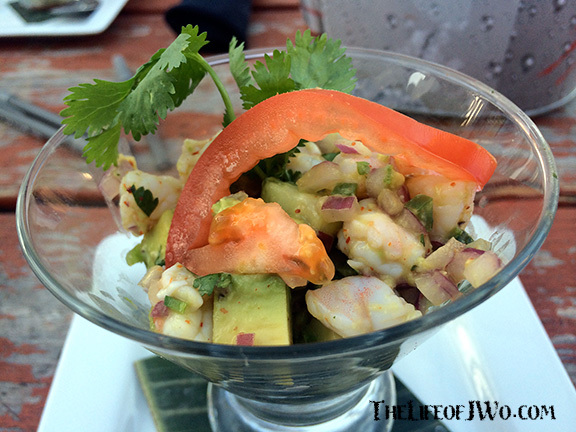 The ceviche was amazing. I was a little worried that it might be too spicy for some people because of the jalapenos, but they were very mild. Even the red onion flavor was tamed by the lime juice and cilantro. 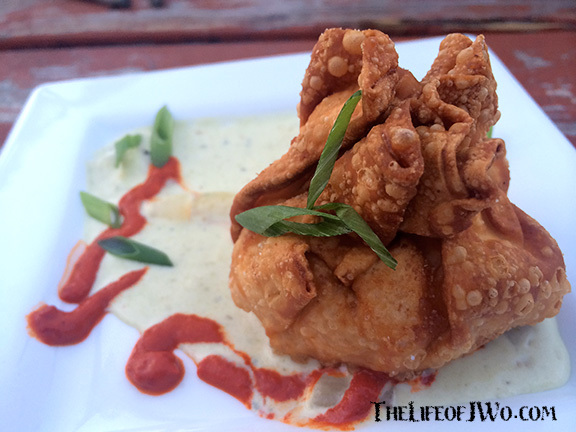 The second course was the Juan-Ton, which was filled with chicken and chorizo and a poblano cream sauce and salsa roja. I’ve had the Juan-Ton before as it was on my Food Bucket List. It’s just as crunchy on the outside and creamy on the inside each time. The third course came out a few minutes later and it was something I haven’t had during our previous visits to Chiwawa. 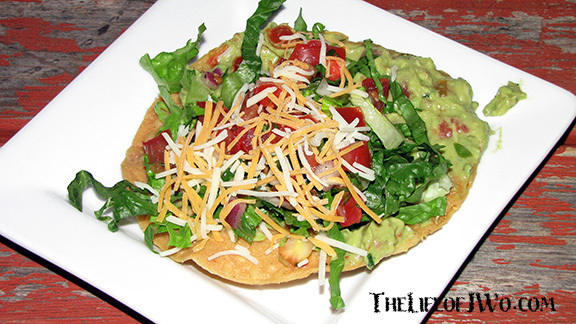 The Tostada Fresca was a fried corn tortilla topped with guacamole, pico de gallo, lettuce and cheese. 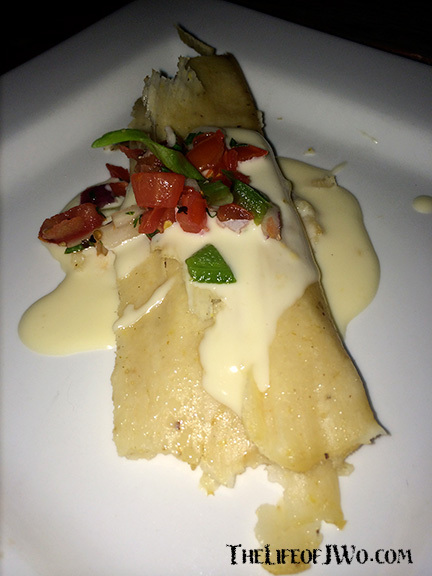 The fourth course was a poblano cream tamale with pico de gallo and cheese sauce. This was my least favorite dish of the night. Not because it tasted bad, just that it was a little bland compared to the previous three dishes. After they cleared the fourth course, a buzz started at our table. Everyone was wondering if it would be a dessert dish and then I heard someone mention churros. 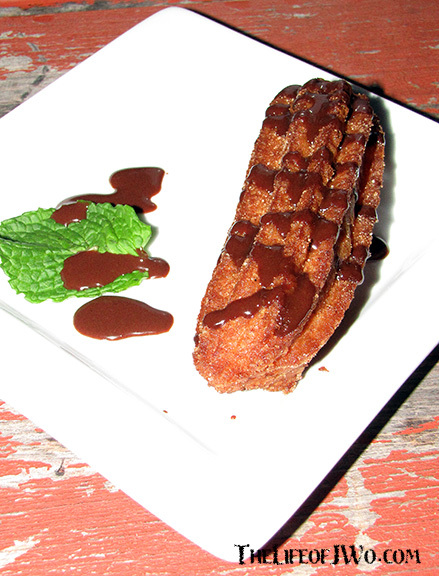 Chef McCarty’s churro was covered with cinnamon and drizzled with chocolate and it melted in my mouth. It was so good that I found myself torn between wanting to eat it as fast as possible yet wishing to eat it slowly to make it last as long as possible. Eventually the churro was gone which meant the evening was winding to a close. Chef McCarty’s dishes paired perfectly with the weather and the patio. Now that summer is just around the corner that means the patios around the city are going to be open, so swing by Chiwawa and check out some of Chef McCarty’s dishes for yourself. Also don’t forget to check out the latest Dishcrawl Memphis offerings. Up next is the Cooper Young Seafood Crawl on May 14. That’s followed by the Main Attraction Crawl on May 20. Gallery | This entry was posted in Daily Life, Food and tagged daily life, Dishcrawl, food, friends, humor, Memphis. Bookmark the permalink. Oh, now I’m hungry. That looked absolutely delicious!